TNA Wrestling presents "Sacrifice," live from Universal Studios in Orlando, Florida. 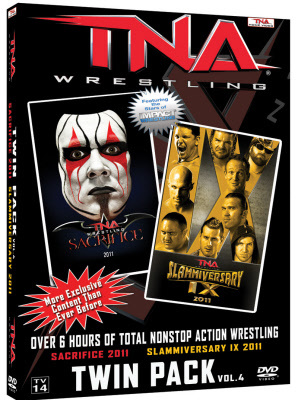 "Sacrifice" features TNA World Heavyweight Champion Sting defending his title against Rob Van Dam, plus the pro wrestling return of Chyna, as she teams with Kurt Angle to face Jeff and Karen Jarrett. World Tag Team Champions Beer Money – Bobby Roode and James Storm – defend their gold against the team of Matt Hardy and a surprise partner, and much more in this action-packed DVD! Celebrate 9 years of Total Nonstop Action as TNA presents "Slammiversary," live from Universal Studios in Orlando. Mr. Anderson takes his war against Sting to a main event match for the TNA World Heavyweight Championship. Bully Ray faces "The Phenomenal" AJ Styles in a brutal and violent "Last Man Standing" match to settle their deadly feud. This epic event features all of your favorite IMPACT WRESTLING Superstars and many more!